It's simple!! You walk the beautiful South West Coast Path, Pembrokeshire Coast Path and other inland routes and we'll deliver your luggage between your accommodations - both cheaply and efficiently! Luggage Transfers Ltd. deliver around 10,000 bags a month on these national walking trails and we are also a "one stop shop" for one night friendly accommodation, short break accommodation, walking itineraries and general information for those planning a walking holiday. Don't just take our word for it, we've hundreds of testimonials on our feedback page, and our independent reviews with Feefo can be seen below. If you select one of the above walking routes (shown in the pictures), you will have access to the only completely free and available, comprehensive one night friendly accommodation and short break accommodation database. This is specifically designed for walkers and cyclists on or near the South West Coast Path, the Pembrokeshire Coast Path and other inland walking routes such as The Two Moors Way. It is used by many major walking companies worldwide and attracts in the region of 1,000 inquiries per week from private walkers who use it to book their walking holidays and short breaks. We keep it as accurate as we can by using feedback from our drivers and customers, and we remove any accommodation which receives two substantive complaints in any one year. Within the listings you will find walker friendly guest houses, B&B's, campsites, hostels and hotels. Some have special facilities for walkers, cyclists and other activity holiday enthusiasts who need short break accommodation. You will also find a wealth of information which will either assist you in booking your walking holiday yourself, or will direct you to a the walking holiday company who specialises in the walking route you wish to walk, if you want it all done for you! We provide and keep this information accurate for free. 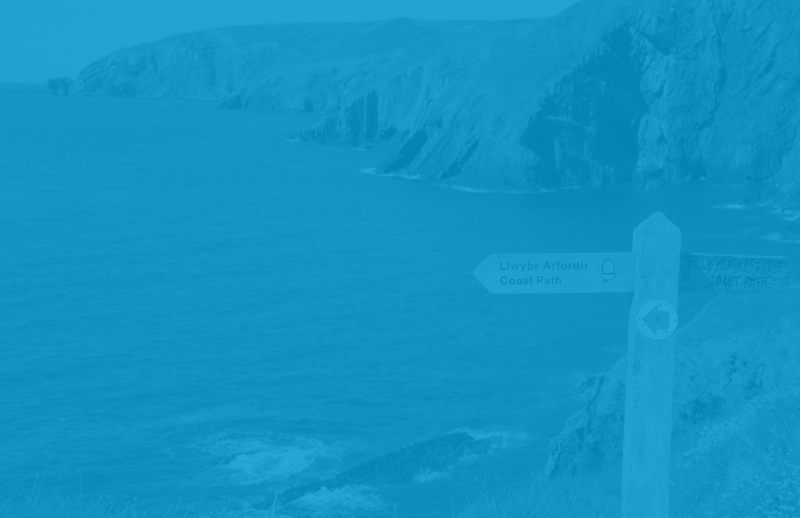 It is our mission to reduce carbon emissions and needless vehicles from the roads of the South West Coast Path and Pembrokeshire Coast Path areas, by combining baggage transfers for walkers and cyclists, and in doing so the more we deliver the more we can reduce costs to you, the customer. So go ahead and use our website to arrange your walking holiday, but then please book your transfers with us - we wont let you down! Other Walking Routes Luggage Transfers Ltd deliver on..
We also service a few other routes, namely these below. All of the above routes are within the south west peninsular bordered by the South West Coast Path and Luggage Transfers Ltd will deliver everywhere within this 630 mile border. If you have a route not shown here, please, by all means contact us and ask.. you never know! Baggage Transfer Service on The Pembrokeshire Coast Path, South West Coast Path, Two Moors Way and many inland walking routes including the Tarka Trail and Coleridge Way. Walkers constantly book holidays around the South West Coast Path, The Two Moors Way, Pembrokeshire Coast Path or anywhere within the counties of Cornwall, Devon, West Somerset and West Dorset, also Pembrokeshire in Wales. They stay at various types of accommodation from B+B's, camp sites and hostels to high quality hotels. We Know that walking on the coastal paths of Britain is tough when carrying a load of baggage on your back, so Lt offer to transfer it between those accommodations for you . When you arrive at your accommodation, your baggage is waiting for you! This can be as low as £9.50 per bag, but this only applies to a handful of transfers. We do apply a discount for single walkers, but this is only £2 per day less than the 2 bag price, as the driver still has to drive the same journey regardless. Some transfers include estuaries or, for some reason are much longer by road than the walk itself, particularly in Cornwall, and because of this we price band our transfers based on time and distance, so walking routes work out more than £9.50 per bag. In all cases we will quote any baggage transfer enquiry usually within hours so that you can choose to accept or not. It tends to reassure walkers to know that we have a 97% quote acceptance rate and we have a price promise that will better or equal the quote of any baggage transfer specialist out there. A main concern for walkers is damage to bags or contents and because a walking holiday inevitably means a lot of moving about, some wear and tear will almost certainly occur, but Luggage Transfers Ltd. insure each of your bags for up to £250 for excessive damage and loss of the bags during the transfer process, that is, whilst in the care of our driver. We cannot accept responsibility for luggage before pick up or after delivery. We do advise you to take out your own holiday insurance independently. - see terms and conditions. Booking is easy, you will need to book your accommodation first, which is far easier to do if you use the specialist short break accommodation database on our web site. When you know where you are walking from and to, simply complete our baggage transfer enquiry form. Our enquiry form is pre-populated with pretty much all the walker friendly and short break friendly accommodation around the South West Coast path and Pembrokeshire Coastal Path, so you won't even have to write out the whole address -start typing in the town and the accommodations will pop up..... simply click the relevant one.....we know them already and have delivered to them before, often hundreds of times! If yours is not on there.. simply type it in and we will do the rest at this end! If you just want a rough idea of price for your baggage transfer before booking your accommodation, that is fine, you can still use the inquiry form but just enter the towns/villages. This will give the exact same price quote as if you had entered the accommodation. However once addresses and postcodes are confirmed this may alter your quote by a couple of pounds either way. A postcode can make a difference! First you will receive your quote for baggage transfers. If you are happy with the quote please let us know by e mail or phone (if imminent). We can then get your booking onto the system and arrange payment method with you. You will receive your confirmation to show this and also acknowledge your payment once it has been received. Should you need to change any details, for instance an accommodation needs changing or a date, please e mail us or call and we would be happy to bring your booking details up to date for you. There are many cycle trails in the south west of England and Pembrokeshire, and although most are in-land, we deliver across almost all of them. Because the south west of England and Pembrokeshire are both peninsular, our coastal drivers can cover almost all of these cycle trails, however we do have to price these journeys differently as cyclists cover many more miles! Transfers for cyclists are naturally priced differently due to the distances covered in a day. Our short break accommodation database is a great help for walkers booking their own walking holiday. Showing only short break friendly accommodation, it is really easy to search for hotels and guest houses who accept one night stays. So if you enquire using our walker friendly accommodation database, you will almost certainly have a warm response and can be assured that you will be staying with someone who is geared up for cyclists and walkers! We consider our business to be an ongoing project. We combine as many kit transfers as possible in order to remove needless road journeys from our beautiful tourist routes which, in turn also reduces emissions. The combination of just 3 transfers will save on average 2 x 30 mile round trips in a car or van. Repeat this every day across 200 regular routes, 8 months a year, and it works out as a massive saving! Currently our annual carbon emissions saving is in the region of 500 tonnes. Please note: By booking with Luggage Transfers you are not taking business from accommodation providers - most only do them because they think it helps to secure the accommodation booking. What constitutes Kit or Luggage or Baggage? We regularly move suitcases, holdalls, tents, rucksacks, big bags, fold up dog crates, and even carrier bags for those on a trekking holiday. Frankly we are not particularly concerned what it is you want delivering as long as it is not dangerous and is below 25kgs in weight. Do you deliver to places that are not on the one night friendly / short break accommodation pages of your web site? Yes, we deliver anywhere on the Pembrokeshire Coast Path, South West Coast Path and anywhere inland of those areas too. If you can't find the accommodation already entered within the booking form, you can fill it out manually with whatever address you will be staying at. This could even be a relatives address or friends who may be putting you up for the night! Please ensure we have their phone number and postal address. Also they will need to be aware that they will receive a phone call the evening before from our driver who will advise of the time he is passing through that particular town. Please click on Frequently Asked Questions to see many more.